The ACROS Fukuoka building in Fukuoka City in Japan is an amazing office building with two very distinct sides: one side looks like a conventional office building with glass walls, but on the other side there is a huge terraced roof that merges with a park. The garden terraces, which reach up to about 60 meters above the ground, contain some 35,000 plants representing 76 species. A huge semicircular atrium and the triangular lobby provide contrast to the greenery, in this space is a symphony hall, offices and shops. The building was constructed on the last remaining green space in the city center, so the architects, Emilio Ambasz & Associates, created a design to preserve the green space as much as possible, while still fitting in a large office building. In addition, a green roof reduces the energy consumption of a building, because it keeps the temperature inside more constant and comfortable. Green roofs also capture rainwater runoff, and support the life of insects and birds. Garden terraces contain some 35,000 plants representing 76 species. Green roof reduces the energy consumption of a building, because it keeps the temperature inside more constant and comfortable. 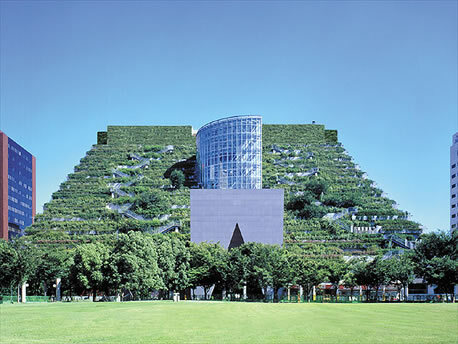 Green roofs also capture rainwater runoff, and support the life of insects and birds. Semicircular atrium and the triangular lobby provide contrast to the greenery, in this space is a symphony hall, offices and shops. The building is a success in Japan, its terraced south facade utilized by many in the area for exercise and rest, affording views of the city and the harbour beyond. This page was last modified 03:51, 27 July 2008. This page has been accessed 43,371 times.